Oil painting on wood panel. 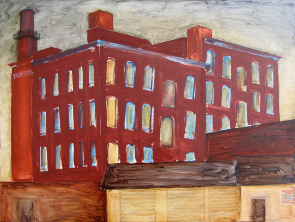 Artist's caption: "Everyone knows these bright blue boarded-up windows in Northern Liberties at 5th and Fairmount." Image shows Trans-Atlantic Company Quality Builders Hardware building.